Purpose: To demonstrate a Bayesian approach utilizing the athlete network to boost the positive predictive value of individual doping classifications. Study Design and Methods: Five data-sets of 10,000 individuals and their networks were simulated and statistically analyzed in R. Background prevalence (BP) of 10%, 20%, 30%, 40%, and 50% was chosen to cover the range of reported estimates (de Hon 2015). Individuals were assigned doping (D) or not doping (ND) classification randomly according to the BP. Each individual’s 10 member network was randomly assigned a co-prevalence (CP) from 0 to 1. Members were randomly assigned a D or ND classification according to a function of the individual’s classification, the CP, and the BP. GP = (Pos – 10,000*.15)/(10,000*.85 – 10000*.15). NPP = GP; k = PND * 10. P(D | ST) = (NPP.85)/(NPP.85^Pos*.15^Neg + (1-NPP)*.85^Neg*.15^Pos)). The cut-point for a D classification was set at .999 per standard WADA practice. Differences between groups were tested by student’s t-test. The boosted Bayesian classification improved test positive predictive values versus the standard test implementation (99.8 +/- .2% vs 66.1 +/- 19.3%, p = .02). The negative predictive values decreased non-significantly (73.5 +/- 15.4% vs 92.3 +/- 5.2%, p > .05). Co-prevalence was higher in the boosted Bayesian D classifications (77.6 +/- 2.8% vs 50 +/- .5%, p < .05). 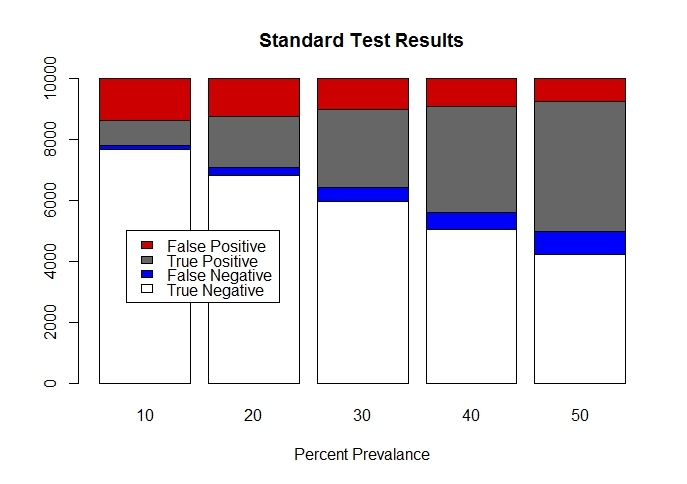 The stacked bar chart of the standard implementation illustrates the usual worsening of the positive predictive value as the background prevalence decreases. Also, it is obvious that even at a background prevalence of 50%, a test with 85% specificity will still have unacceptably high numbers of false positives for sanctioning purposes. In the standard implementation this test would be good only from a surveillance perspective, or to guide targeted testing. Compared to the above, this chart shows that the utilization of the doping co-prevalence within a network to boost the positive predictive value of an individual’s result allows the near elimination of false positives. This test with only 85% specificity in standard form, would now be useful for sanctioning purposes even at very low rates of background prevalence. Most importantly, the box-plot shows that the boosted test now targets individuals within networks where there is a high co-prevalence of doping. This targeting means that any given sanction has a far greater probability of disrupting a doping network. Similarly, clean athletes who are pro-active in seeking out clean networks and promoting ethical behavior are at far lower risk of a random false positive. Conclusion: A Bayesian approach utilizing transverse monitoring of the athlete network can significantly improve individual doping classification when individual probability correlates within their network. Significance: This method has broad implications for future anti-doping strategies to more accurately target the central nodes of doping behavior. Cook AE, Hacker DJ, Webb AK, Osher D, Kristjansson SD, Woltz DJ, Kircher JC. Lyin’ eyes: ocular-motor measures of reading reveal deception. J Exp Psychol Appl. 2012 Sep;18(3):301-13.
de Hon O, Kuipers H, van Bottenburg M. Prevalence of doping use in elite sports: a review of numbers and methods. Sports Med. 2015 Jan;45(1):57-69.